Willie Perkins left the staid, conservative world of commercial bank auditing to jump headlong into the burgeoning beginnings of The Allman Brothers Band and follows their meteoric and sometimes tragic rise, fall, and revival. Perkins’s interest in the business of music and his association with an interesting pair of friends led him to the opportunity to work with the Allmans at the earliest stage of their career. For the first time we learn from a true insider what it was like to live the nomadic life on the road with the Allmans from their earliest low-buck club tours through the triumphant million-dollar months of outdoor stadium dates in the mid-seventies. Perkins vividly describes living in the band’s “Big House,” and what it was like to room on the road with the legendary Duane Allman and what a truly amazing person he was. The author tells of all the band and crew members, and shares how they all dealt with the bumpy road to rock stardom. The fast life of touring, performing, and recording, with its huge rewards and triumphs, is seen with literary clarity in these pages. Perkins’s memory of the sorrow and grief suffered from the untimely deaths of Duane Allman and Berry Oakley is paralleled by the band’s dogged determination not to give up. The reader is not spared the details of the destructiveness of drug and alcohol abuse, and will learn the true facts behind the drug trial of John “Scooter” Herring. Read how the band and its crew dealt with family life, girlfriends, and groupies. Also, you will learn about the making of the legendary Live At Fillmore East album, the band’s generous charitable contributions, and their relationship with Jimmy Carter. No book on The Allman Brothers band would be complete without an account of Gregg Allman’s solo comeback of the eighties and the twentieth-anniversary reunion tour of The Allman Brothers Band. 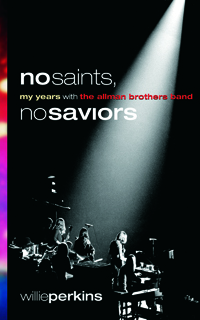 “No Saints, No Saviors” is a story of triumphs and heartbreaks, but ultimately it is a story about how the music of The Allman Brothers Band may well live forever.